The feelings I wrote about in yesterdays blog really opened my heart and my eyes to understand a few things of what I have been going through this past year. I truly believe that God opens our eyes to see things through messages and events in our lives. That phone call I had with my sister yesterday when realizing that I have unprocessed feelings about my moms death – really woke me to a new understanding that its not just about my mom, but there are other emotions deep within that create a subconscious disconnection to self. Its no surprise that this past year has been hard on me I have felt really disconnected in many ways and I feel numb to a lot of things that are having n effect on me and my every day life. I think I have a lot of unprocessed things going on inside that need voice, need a place to heal, need a place to be felt and understood more. 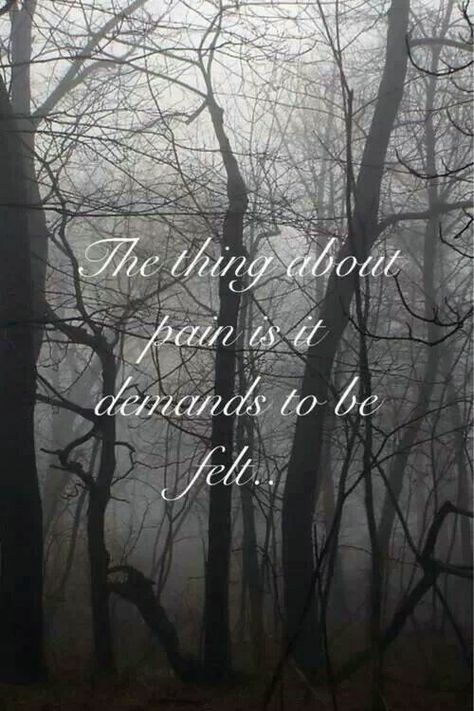 Like the quote above says “the thing about pain is, it demands to be felt” .. no matter how hard you tr and bury feelings (conscious or subconscious) they will always find a way to be felt, and sometimes those unprocessed feelings turn inward and disconnect us from everyone and everything we love. In session my therapist talked about unprocessed feelings and he was in awe of what message I was feeling from God .. it all made sense to the struggle I have been having this year which is “connection with others” “being isolated to activities I used to love” “not eating much” “wanting to be alone rather being around others” “not showing up to the places that used to make me happy” .. those are all signs that I am disconnected and I have known that this year, I just didn’t know WHY. I feel I finally understand WHY and my talk with my sister last night really woke me up to see that I am disconnected and I need to find a way to process feelings that I believe have gone inward. its scary and exciting because healing can happen, and I finally understand why this year has been so hard on me. The death of my mom really hit me hard, but a part of me is in denial thinking she is still at home in bed sick like she has been for years and years. The same goes with something that happened a couple of years ago that really disconnected me – I think I am still holding pieces of these emotions and feelings – unprocessed feelings that need space and healing. I heard a woman talk once about how, we can keep putting band-aids over a open wound, but unless you let it have air to heal, it will never heal the way it needs to heal. Emotions and feelings are the same – you need to give it light to move it from the dark. I’m not sure what this all looks like, but I believe I am on the right path to processing these unprocessed feelings. Karen – this is good!! I’ll be thinking of you (and praying) as you open up and walk through the changes (challenges?) of these feelings. Thank you so much Bevy … I appreciate that very much and love the friends and support I have in this. God will continue to guide you there! THANK YOU Friend .. that means a lot to me and yes God is good and he is taking these steps with me :) thank you for reading! My pain of the last year no where compares to losing a loved one, but pain is pain. I have intentionally put up walls so that I cannot be hurt again. I know it’s time to let those walls fall down and begin the healing process. Hugs!